My Morning Headlines are now posted at the right. Click on the image for a full view. Also, reminder, my full web site is now ready. Click the link and you can find "My Blog" posted there in addition to much more local weather images. First: My favorite for winter events is the Canadian. Here you can see the clipper in central Ohio on Wednesday afternoon. I highlighted the potential snow line in yellow, as the precipitation moves in during the afternoon hours. This type of system does not often have a lot of moisture with it, but this quick move and path likely overhead or just to our south, will give us it's full punch. Early bet on 1" accumulating or more. The real indication of the amount begins about 60 hours before the event, which would be this morning's package. If i see anything significant, I'll update it here. 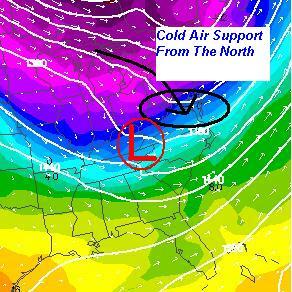 Either way, the support for cold air is seen here on the GFS. A nice trough in the 850mb level showing the cold air aloft to our north continues to flow in. This map shows the important freezing line south of central Maryland. So even though high temperatures will be above freezing at ground level, cloud level support for snow is there with temperatures -4C to -6C. 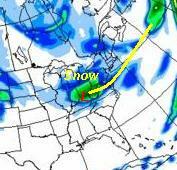 Behind this, another quick moving system will reach us on Friday with wintry mix. Looks like winter is here, and glad I finished my new web site just in time. Please see the link above and surf around. If there is something more you would like to see- contact me.